Over 500 demonstrators gathered in front of the remote immigrant detention jail known as the Broward Transitional Center in Pompano Beach, Florida on Saturday, Feb. 28 to demand that the Obama administration stop the threatened deportation of some 30,000 Haitians back to their strife and storm battered country. The protest was called by Haitian Women of Miami (FANM), Haitian Citizen United Taskforce (HCUT), the Florida Immigrant Advocacy Center (FIAC), the Florida Immigrant Coalition (FLIC), and the union Unite for Dignity. Officials of Miami Dade County, where most Haitians in South Florida live, assisted by providing buses for protestors coming from Miami, 30 miles south. The rally was boisterous but peaceful and well-organized. The crowd demanded TPS (Temporary Protected Status) for Haitians, which was previously denied by the Bush administration. TPS has been granted in recent years to nine countries plagued by war or natural disasters: El Salvador, Honduras, Liberia, Montserrat, Nicaragua, Sierra Leone, Somalia, and Sudan. It allows refugees from those countries to live and work legally in the US. The designation is effective for a minimum of six months and a maximum of 18 months. After four storms in August and September 2008 brought widespread death and destruction to Haiti, the U.S. government suspended Haitian deportations for three months. But expulsions resumed after Dec. 5, sending dozens of Haitians back to their homeland since then. Between January and December 2008, 1024 Haitians were repatriated, said Barbara Gonzalez, a spokeswoman for U.S. Customs and Immigration Enforcement or ICE. In February, U.S. immigration officials announced that 30,299 Haitians were subject to immediate deportation back to Haiti. Jonel Lemy, a Haitian-American lawyer with the Haitian Lawyers Association, told the Sun Sentinel that he has seen an increase in deportation cases in the last six months, even taking the three month reprieve into account. "Arrests are up," Lemy said. "People are being arrested as they drop their kids off at school or on their way to work." Lending visibility to the rally were hip-hop star Wyclef Jean and his younger sister Melky Jean, who is also a singer. She performed a passionate song in Krey l and said that TPS for Haitians was "only fair." She founded and helps run the CARMA Foundation which provides shoes and other relief to poor children in Haiti. 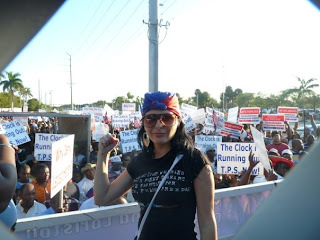 Farah Juste, another well-known Haitian singer and activist, took the microphone after Melky to lead the crowd in an improvised song in Krey l: "Prezidan Obama, se TPS nou mande." (President Obama, we demand TPS). 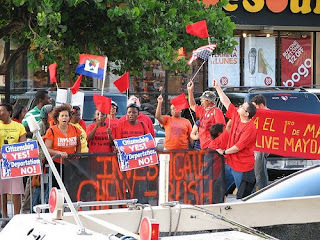 Lavarice Gaudin, a leader with the long-standing grassroots organization Veye Yo based in Miami's Little Haiti, addressed the hundreds of demonstrators on behalf of the group's founder Father Gérard Jean Juste, who couldn't attend the rally due to poor health. Lavarice telephoned Jean-Juste, who then addressed the crowd by phone, which received him with warmth and enthusiasm. "What do we want?" Jean-Juste asked. "TPS," the crowd loudly responded. "When do we want it?" Jean-Juste continued. "NOW!" the crowd came back. Other speakers and singers communed with the crowd, expressing solidarity with the Haitians held in the nearby detention center. Wyclef Jean made a surprise appearance at the rally, which delighted the crowd.. Speaking in English and Krey l, he said he had a message for President Obama, "my President, our President." "Haitians are strong in number but not in politics," he said. "Haiti is the poorest country in the hemisphere. If they deport 30,000 people back to Haiti, we will see 60,000 coming to the USA the following week, only because the country is in bad shape. I left Haiti when I was 9 years old and I believed in the American dream. I think giving justice to Haitians is the American dream. My President Obama, when my parent came here, they didn't have papers, but they worked hard for 15 years. Like in this situation, if they had been sent back to Haiti, America and the world wouldn't have had the gift of Wyclef Jean. This is not a Haitian cause. This is a human cause." In an interview with Fox TV after his intervention, Wyclef noted that Haitians should receive the same treatment and rights as "my Cubans brothers and sisters." "Haitians need to be politically empowered in Florida," he continued. "Otherwise we will keep on having the same problem." "I want to let young people know that if you don't stand for something, you stand for nothing," he told Haiti Liberté. "We need to be strong politically, I encourage young Haitians to study... We have to take part in the Haitian struggle otherwise we fool ourselves if we don't stand up for ourselves." FANM's Marleine Bastiene asked Wyclef why he had felt compelled to attend a rally that was not in his schedule. "When I found out this [rally] was happening, I decided to come and ask President Obama to stop deportations to Haiti," he replied. "Even though he's dealing with the economic crisis we are facing, Haiti is in extreme crisis, he has to act immediately to stop all deportations to Haiti; otherwise they will have huge problems in the island which will have repercussions back in the US ultimately." Of the 30, 000 Haitians with deportation orders against them, 600 are in detention centers and 260 are allowed to stay at home and in their communities, although their movements are monitored with ankle bracelet transmitters. Haitian President René Préval, who has also asked Washington to grant TPS to Haitians in the U.S., has effectively blocked deportations by having his government refuse to grant would-be deportees travel documents. "President Obama, the time has arrived to right this wrong," said Marleine Bastien to the crowd. The world capitalist crisis and soaring jobless rate in the US put great pressure on Obama to deport undocumented workers, as right-wing politicians urge. But Obama has lots of political capital to lose with Haitian-Americans, one of his power bases, if their undocumented compatriots are deported. Conversely, his administration gains lots of easy political capital if it grants TPS, a very short-term measure which does nothing to address the fundamental injustice of U.S. immigration restrictions and their enforcement. Clearly, many in the crowd had high hopes that their continued mobilization would sway the Obama administration to grant the TPS that the Bush administration denied. "We will continue to protest and take our message to Washington, and we expect President Obama to support us," lawyer Jonel Lemy said.